In a recent blog we told you about the ways that bringing your child to our kids’ fitness program can help with just about any sport out there. After all, the work we do in our after school program not only gets kids exercise, but it helps build their body for other sports as well. For instance, the upper arm strength we help kids attain can be beneficial in many sports, including baseball, basketball, and tennis. We also ensure kids are ready for sports that require cardio and leg exertion, such as football, soccer, and hockey. But we’re happy to say that it’s not just sports that can be improved by having kids stop by our kids’ fitness program. In fact, sometimes engaging in such a physical activity can substantially help kids in afterschool programs that aren’t typically seen as that physical. 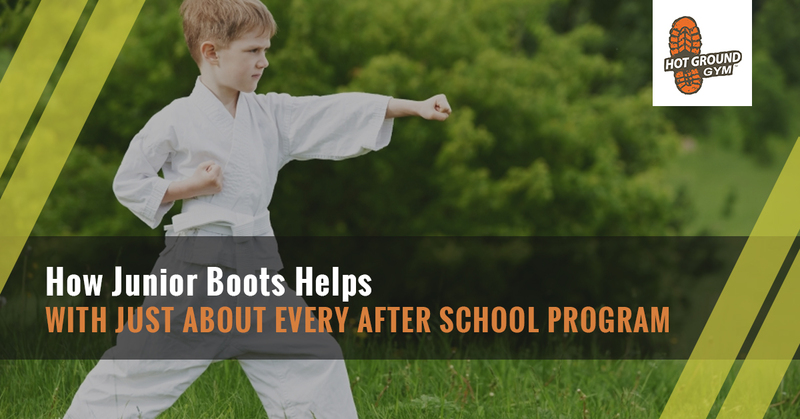 Let’s investigate how Junior Boots, our afterschool fitness for kids, can help in other areas of their lives. While martial arts can certainly be a sport, it’s just as likely that people are engaging in it to get exercise and learn a form of self-defense. While Junior Boots isn’t a martial art, it’s kind of like the other side of what kids see in martial arts movies. When you watch a martial arts movie, much of what is going on isn’t just about the fighting itself. Half of it is people using the environment around them as they try to gain control of the situation: vaulting from walls, balancing on small surfaces, leaping over couches. All of these require balance that can lead kids to get better in martial arts, whether or not a couch is involved in the actual fight! Of course, you can’t forget about the discipline that martial arts require. In martial arts, kids must learn not only when to fight but also when to refrain from fighting. They also must learn to do exactly what their instructor says so that no one gets hurt during sparring. This is a very similar form of discipline that you can find at Hot Ground Gym. While Boy Scout and Girl Scouts might not be as popular as they once were, they still play an important part in many kids lives. Scouts are an excellent way to teach kids skills that just aren’t found in school or learned around the home. How can Junior Boots increase a child’s interest in Scouting? Well, first of all, is the physical aspect, which can help a child endure long hikes or be able to climb a tree better. And Junior Boots can also help a child listen better to instructions, which helps not only with Scouting but with school as well. Nowhere are Scouting and Hot Ground Gym more closely connected than with our Winter and Summer Camps here in Vernon Hills. Unlike most camps, we’re not just about one thing (such as a soccer or football camp), and we’re not just about filling time (like heading to a movie theater). Our camps are about teaching kids new skills, survival skills, first aid, outdoor cooking, and orienteering. What they don’t learn in Scouts they might just learn from Hot Ground Gyms Leadership Camps! Most music kids encounter in school is about working together in order to create something beautiful. The person who is leading in a choir isn’t the one singing loudest, but the one who can lead by example. A band member who can be heard usually isn’t soloing; they’re just sticking out! Our Junior Boots program is about working together to reach the same goal, just as kids might do in any sort of organize music ensemble. While we might not making beautiful music at Junior Boots, we are teaching kids how to work together…even if it means working with a few kids who aren’t they’re favorite people. There are also the physical aspects of music programs that have to be addressed. Having a stronger body thanks to our kids’ after-school exercise program can substantially increase lung capacity, which can help brass and woodwind players. Exercise can also improve the stamina needed for those long days at marching band. How can aspects of our kid’s gym help kids who love to act? Well, there’s always the teamwork aspect that we stress every time your child is here. But there’s also the idea of roles that need exploring. At Hot Ground Gym, we emphasize the idea of “role and a goal,” in that sometimes kids will be the lead, and sometimes they’ll in support. Kind of sounds like a play, doesn’t it, because each person has their role to perform. At Hot Ground, every kid is put into a leadership role at some time or another to see how they like it. Likewise, kids will learn to follow the leader and engage in problem-solving. In our last article, we talked about how hockey doesn’t get the respect it deserves. After all, hockey players have to be strong, graceful, athletic, and be able to exert themselves constantly as they head up and down the ice. All of this while keeping focused on a three-inch-wide puck. Similarly, dance doesn’t get the respect it deserves. It requires incredible strength of the legs and feet, as well as incredible athleticism throughout the body. Much like hockey, the difficult things that are done have to appear easy and graceful. Strength, balance, recovery from falls, fist fights…except for on-ice fistfights, dance and hockey share more than most people realize! How can Hot Ground Gym help with dance? Balance is certainly the greatest aspect that we offer. Many pieces of our equipment are designed to help kids increase their balance, from the simple balance beam to our platforms that are held by the other kids! Of course, there’s also the fast recovery that’s necessary if you lose that balance, because when you fall in dance you don’t simply lay there; you get back up and keep dancing. The basic cardio that we emphasize in Junior Boots can also lead to being able to dance for longer periods. No matter what type of after-school program your child is most interested in, we bet that the discipline and exercise that Hot Ground offers can help them become better at whatever they’re doing. Check out the schedule here to see when the best time would be for you kid to come!